Elektra comes aboard for a brief, brutal team-up as Daredevil attempts to kidnap Wesley and use him against Mayor Fisk. This whole volume of Daredevil has an unusual storytelling tone. It's a lot more action-oriented than the contemporary Marvel status quo, and this usually (but not always) works to its benefit. It's certainly a positive point for this exceptional example. Daredevil speaks in the clipped, direct tones of 80s Batman. He lets the action unfolding in the art fill out the meaning of his words. This issue starts with a love scene and ends with a fight scene, and in both, words and visuals are intimately intertwined. They rely on each other for completion. It's a delicate dance, and it absolutely requires a skilled, committed artist. This volume has had its ups and downs, and most of the downs can be tied to a lack of artistic oomph. There's no danger of an oomph-shortage here. Phil Noto is one of those rare talents who's so good and so distinctive that he makes a mockery of my policy of talking about the work rather than the artist. I can't discuss the brilliance of these pages and pretend that they could have been put together by anybody else. Phil Noto has complete and total mastery of anatomy - gorgeous, naturalistic faces in particular - under his belt. When there's never any question about "can he draw X in Y position," an artist has to turn to playing with composition and colour to find challenges. In Daredevil #610, Mr. Noto sets himself challenges aplenty and bowls them all down like tenpins. He's struck the perfect balance between line and colour. More precisely, he's showing off an ability to swing that balance around at will to match the tone of the story. The initial romantic scene is a tour-de-force of modulated shading where the linework is practically an afterthought. The lines gradually strengthen throughout the issue, fitting the rising pace of action. The final fight scene pits Elektra and Daredevil against the arc's creepy new assassin in an abandoned church. (Okay, granted, that's a bit of a gimme for a Daredevil fight.) The characters are all defined in vibrant red, the setting is all cold greys, the lines between them come down hard and black, and the combat is absolutely spellbinding. One of the biggest advantages this issue enjoys is a solid ability to stand on its own. It segues seamlessly out of the last issue and delivers significant developments for the current arc, but it sets aside many of the contentious changes made in the last issue. This works entirely to its benefit. The art is the standout feature here, but the script is miles above the ordinary as well. Elektra adds an air of uncertainty - of literally deadly ambiguity - to what might otherwise be a straightforward plot. Matt has plenty of questions about her presence, and readers will too. Some of those questions are posed outright, but others are merely hinted at in a wonderfully subtle way. If you haven't picked up a Daredevil comic in years - or ever - you can read #610 and enjoy it for what it is: A brilliant and self-contained caper story. It is thrilling and gorgeous and spell-binding. I don't know if subsequent issues can possibly live up to the standard this one sets. 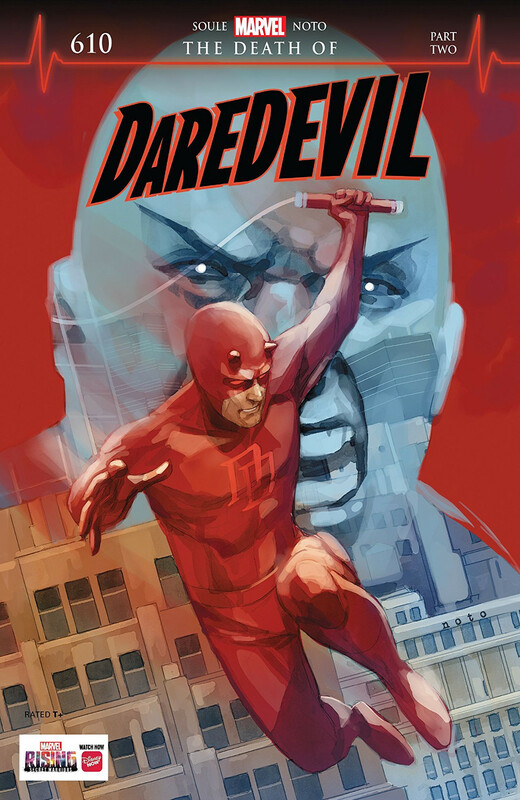 Regardless of what comes next, Daredevil #610 carves its own niche as a must-read. Subjective take: This issue shelves every single problematic development from #609. While I expect they'll return in the future, their absence plays a large role in making #610 all-time great.